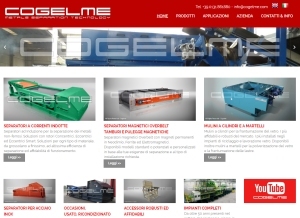 Cogelme develops and produces high-performing equipment and solutions for recycling industries. Sharing with you the best knowledge and extensive experience, our engineers present custom-designed systems to optimize your waste processing operations and enhance profitability. When needed, Cogelme collaborates with professionals of other equipment developers, to propose for a client a complete solution. Cogelme gives high importance to reliable, durable, perfect-quality products and competitive pricing to maintain the best cost-performance ratio in the industry. Thanks to the young spirit and energy, our management team creates and builds lasting partnership based on superior client relationships. Cogelme has designed and installed many successful customized systems and plants according to specific needs of her clients in: Argentina, Austria, Bahrain, Bulgaria, Canada, Cyprus, Egypt, Estonia, Finland, France, Germany, Greece, England, Ireland, Israel, Italy, Latvia, Lithuania, Poland, Portugal, Czech Republic, Russia, Slovenia, Spain, Switzerland, USA, etc. In early 1960s, the son of the engineer, Luigi – a man of great education and passion for science – took over the research started by his farther, and made significant contributions to the construction of electric motors, current transformers, electrical equipment, electromagnetic separators (Overbelt), glass crushers for the glass production industry. It might be worth to mention that his inventions are still used by some clients. Today, Cogelme is run by the grandson of the engineer, Luca, who successfully blends the inherited passion for invention and a next-generation approach to create excellence and deliver high-quality products and services. The company continues its growth and keeps in step with the latest technological achievements, always ready to propose new solutions for material recycling.